Reason to buy from us. This product is not suitable for kids under age of 8. It is highly detailed, with beautiful body paint and accurate markings. The headlights look quite realistic and the doors and hood can open to reveal very good interior details. 1:24 Scale. Item must be New and Unused in original factory condition. Product Details. Condition - Excellent model in the box but the box. 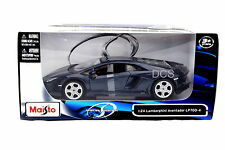 1:24 scale diecast model car of Lamborghini Aventador LP700-4 BLUE. Openable trunk and doors with Rubber tires. Maisto Lamborghini Gallardo LP 560-4 scale 1/24 New in Box. Made By Maisto. You are viewing a rare Maistro 1:24-Scale Lamborghini Diablo Diecast Model. Still contains all the plastic wrapping and looks like it was never removed from the box. The original box does show some significant wear. Still a very cool item to display! Add this to your collection today! • Instagram - osakaclubracer Thanks for looking. View my other listings for more Rare & Vintage Parts / Accessories / Memorabilia and more! It is highly detailed, with beautiful body paint and accurate markings. The headlights look quite realistic and the doors and hood can open to reveal very good interior details. We have 3 color variations, refer the last photos. Lamborghini Gallardo LP560-4 POLIZIA Maisto Special Edition ---1:24 Scale Model 31299 ---Made of die-cast metal with some plastic parts ---Opening doors and hood. ---Detailed interior, exterior and engine compartment. ---Police (Polizia) lights and graphics. ---Approximate dimensions L 7 1/2" x W 3 1/4" x H 2" ---This is a new item that does not come in a retail display box. 24-0542-15 We are pleased to offer combined shipping rates for multiple purchases. LAMBORGHINI HURACAN. 1/24 SCALE. A LITTLE BENT. BOX IN GOOD CONDITION. Model : LAMBORGHINI MURCIELAGO LP 640 1/24. MADE BY : MAISTO. COLOR : BABY BLUE. We will do our best to reply as soon as possible. Opening : DOORS, BACK ENGINE COVER. Model : LAMBORGHINI HURACAN LP 610-4 POLICE POLIZIA CAR 1/24. MADE BY : MAISTO. COLOR : BLUE. Opening : DOORS, BACK ENGINE COVER. Model : LAMBORGHINI HURACAN LP610-4 POLICE CAR 1/24. MADE BY : MAISTO. COLOR : BLUE / WHITE. We will do our best to reply as soon as possible. MADE BY : MAISTO. COLOR : MATTE BLACK. We will do our best to reply as soon as possible. Maisto Lamborghini Aventador LP700-4. Made By Maisto. scale 1/24 New in Box. Maisto Lamborghini Aventador LP 700-4 1:24. Exterior Color: Orange. Scale: 1:24. Open Doors, Back engine cover. We are not responsible for your assumption. Color: Yellow. We will accept shoes and clothing accessories and Handbag back if unhappy for any reason under the following conditions. Rubber tires. MAISTO 1/24 LAMBORGHINI HURACAN LP610-4. Scale : 1:24. Color : Yellow. Made By Maisto. Color Matte Black. What you see in the photos is what you will receive. Model : LAMBORGHINI MURCIELAGO LP-640 1/24. MADE BY : MAISTO. COLOR : GREEN. Opening : DOORS, BACK ENGINE COVER. Lamborghini Aventador LP700-4 1:24 Diecast Car. Scale: 1:24. Color: Blue. Model : LAMBORGHINI AVENTADOR LP700-4 1/24. MADE BY : MAISTO. COLOR : GREY. We will do our best to reply as soon as possible. Opening : DOORS, BACK ENGINE COVER. 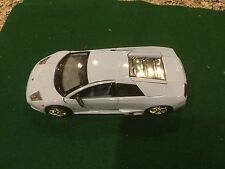 Maisto Lamborghini Galardo LP 560-4 Model Kit White NEW in Box. Made By Maisto. (PR, HI, AK, APO, P.O BOX, FPO, HI ). Maisto Lamborghini Huracan LP610-4 Polizia 1:24. New without Box. Exterior Color: Blue. Scale: 1:24. LAMBORGHINI URUS 1/24. Made By : MAISTO. Color : YELLOW. Opening : DOORS. 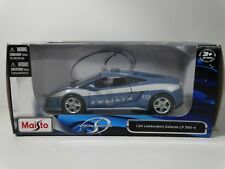 1 PC Lamborghini Huracan LP610-4 Diecast - Police Blue. 1:24 Scale. Item must be New and Unused in original factory condition. Product Details. Lamborghini Murcielago LP640 1:24 Diecast Car. Color: Orange. Scale: 1:24. Manufacturer: Maisto. The details of this diecast replica are incredible! Features detailed interior and realistic dashboard, real rubber tires, opening doors. Scale: 1:24. Therefore owning it is like owning the real car. MAISTO LAMBORGHINI SE 1/24 SCALE YELLOW NIP. Lamborghini Huracan LP610-4 Diecast Model 32513. Made By Maisto. Police Car. Color Blue White. What you see in the photos is what you will receive. Model : LAMBORGHINI HURACAN LP 610-4 1/24. MADE BY : MAISTO. COLOR : YELLOW. Maisto DieCastOrange Lamborghini Murcielago LP 640 - both doors and engine hood opens - 1:24 scale - looks to be in very good condition. 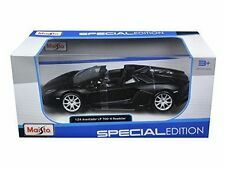 MAISTO SPECIAL EDITION LAMBORGHINI MURCIELAGO LP640scale 1/24 New in Box. Made By Maisto.